White Deer cars more information"
Horatio (12-1), McClellanville (12-1), Torrance (12-1), Urbana (12-1), and Voyager (10 Section 4 Duplex single rooms). This is from an old field trip, McClellanville I assume is what I show for Principio. Thanks, RDGRAILFAN, for the additional info! ROALD AMUNDSEN is currently located at McCormick-Stillman Railroad Park in Scottsdale, Arizona. IIRC, she's owned by the City of Scottsdale and is open to the public on certain dates. I forget if anyone mentioned the Robert Peary in this post, but it's located at Campo. Pretty interesting that all four of the Presidential Pullmans still survive. I think there is too much coffee in Seattle but we can thank that for all the work being done to make these lists possible. Maitland is the only Pullman car in sleeper configuration at TVRM. 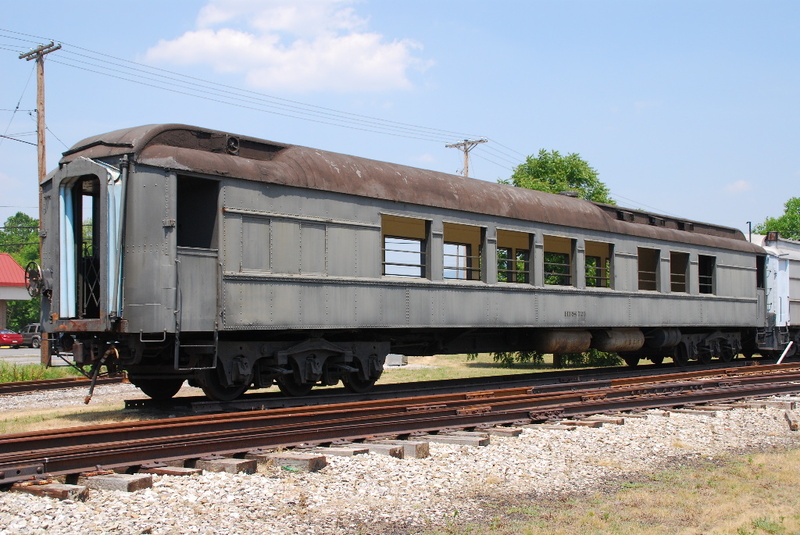 We have eight other cars that were built by the Southern from Pullman cars (three coaches, four baggage and one theater car). Do we really want to list all of them, or just surviving Pullman Heavyweight Sleeping cars[u]?[/u]. If we go away from sleeping cars the list of survivors will go up considerably but, maybe that's OK.
"99. City of Peru... (to be refurbished by Pete Messina as sleeper)"
I wouldn't hold my breath on this one. Not only is the car in bad shape but the shake-up with the NOPB's management about two years ago have called into question not only the millions (plural) of dollars spent on "98. City of Lafayette" and "100. City of Wabash" but their possible future. Last I have heard the two refurbished cars being used for special occasions but no images of the cars have been posted since the shake-up and there was talk of them being sold off if a buyer or buyers could be found. Does anyone have any more recent info on these ex-WAB cars??? Thanks, Alan, for the info on the Roald Amundsen! Thanks, Tim, for the info on the TVRM cars! Dean Levin states in the opening post that the Glen Blair (as of 2006) was owned and located at LASTA outside of New Orleans. "141. Mystery Car--the website also lists another surviving PRR sleeper, name Hazelton, a Plan #2410 12S-1DR built in 1910 and assigned to the PRR--later rebuilt to a Tourist sleeper, and sold to the GM&O or Columbus & Greenville, ending up in MofW service--car was acquired by the Portsmouth Chapter NRHS and was stored in Norfolk as of 2000 (when the list was typed up)--another list of extant PRR cars also has the same sleeper listed. However, this car does not have an entry in Tom Madden's Pullman Project CCR database. Hmm. Is the Hazelton a wood car with steel sheathing?? (That would explain its absence from the Pullman Project, which starts with the all-steel heavyweights.)" And, thank you, Rainier Rails, for the info on the Cumberland Club. Will get the history put into the Index in the next day or so, once I thaw out from all the cold. Just as a note, the Palm Lane is only on lease to IPH. The CNY Chapter did not want to let it go. Also of note in NY is the Glen Sidel?, located in Remsen, NY and from what I understand it is also going to IPH. Note the caption indicating the ex-SAL origins and the misspelling (intentional?) of "Haselton". Thought somebody from IRM might chime in here, but since they haven't, a bit of clarification on the Inglehome. The actual name of the organization was the Illini Railroad Club (not the Illinois RR Club) and the car when owned by them was known as Chief Illini. When operated by them, she was painted orange with blue trim, the colors of the University of Illinois. "Note the caption indicating the ex-SAL origins and the misspelling (intentional?) of "Haselton"." The problem is that the car's name is not mispelled. In both the book, The Complete List of Heavyweight Pullman Cars and in Tom Madden's Pullman Cae Construction Records the name is spelled with an "S". "128. Greencastle (Lot #4691, Plan #2416D, 1923, 1DR-plr [26 seats], PRR)--sold to NC&StL and converted to coach #734 (1941) to coach-lng-obs #1103 to TVRM"
Not exactly. 1103, er actually L&N 2599 belongs to VLIX, not TVRM. So the history recounted at the PRR Survivors website about the car being PRR Hazleton then GM&O or C&G before being acquired by the Tidewater NRHS is in conflict with the photo captions saying the red car in Little Creek is a former SAL car. Anyone want to sort through that mess? Pullman's "Hazelton - unable to locate SAL# or name, web has spelling errors but same car, apparently was SAL at one time. Only reference is Hazelton . Sleeper (paint PRR)	was assigned to assigned to PRR for a period of time configuration 12-1	1910	NRHS - Portsmouth	Norfolk, VA	Stored	Built as Pullman's "Hazelton;" rebuilt 1940 as a 12-1 NO REFERENCE, 2 CARS ON SITE, car is panted in PRR paint with a baggage car. Visited site, no pictures, No one around to answer questions. Not in bad shape from my view point. VILLA REAL - Sleeper, P3411 1910 owners of record Herman Page & Al Sauer, Raleigh, NC, not sure of how complete restoration is, I was in Raleigh area in spring of 2013 was told car was moved. I show cross reference to PULLMAN (G)LENOVER #8803, name change? or wrong on my part.